It's the best of both worlds: colorful workbooks to motivate your students combined with a user-friendly site that matches their personalities to careers from the Occupational Outlook Handbook. This multimedia activity adds a card with an Internet PIN to each workbook. Students log on from home or school to create a personal page** to match their color scores to occupations at four incremental educational levels. Seeing how opportunities and income increase along with educational commitment is both eye-opening and motivating – the best kind of counseling. Each matching job is first summarized in a short paragraph that identifies the kind of person who might do well in that occupation. A click on the More Information button presents the entire chapter in the Occupational Outlook Handbook for that job, including opportunities, salaries, etc. **Educators get their own home page to monitor their student’s visits and job recommendations. See the COMPUTER DEMO for details. 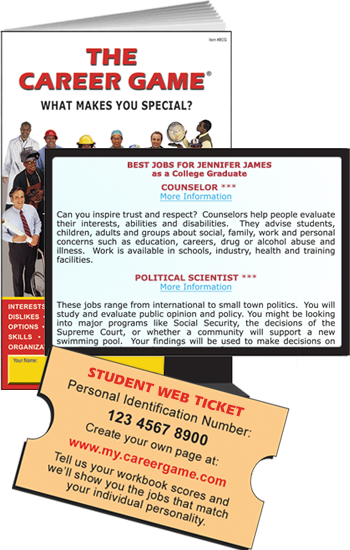 Item # BCGW 78 combines workbooks and web tickets in a package price. 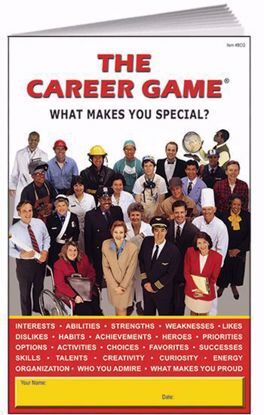 For workbooks alone, click The Career Game in Related Multimedia below.